REVIEW: Bon Jovi Live In Melbourne! 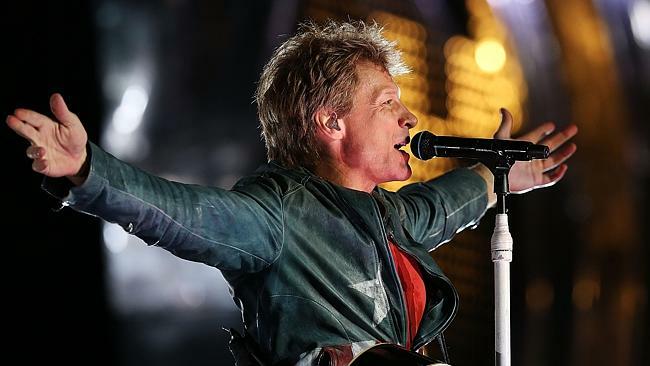 A wrap on Bon Jovi’s rocking Melbourne gig by Paul Cashmere. My concerns in heading along to see the Samboraless Bon Jovi for the first time was that the energy would not be there. Actually it was quite the opposite. The energy was back. The last tour three years ago lacked a spark that was probably the start of the Jon and Richie tension. Without Richie, David Bryan takes on a much more prominent profile in the band. Previously relegated to the backbench of the live act, Bryan now has much higher profile. This tour is much bigger and a lot better than the last. The stage is designed as a giant 1959 Buick Electra 225. The car was christened Sofia, in honour of the city of Sofia, Bulgaria where the tour started back in May. The setlist covered the entire Bon Jovi career with songs from every album except for 1985’s 7800 Degrees Fahrenheit and 2000’s Crush. This band has sold 106.5 million albums worldwide so there are a lot of fans of a lot of songs and pleasing everyone is a seemingly impossible task. The last three albums Lost Highway (2007), The Circle (2009) and What About Now (2013) make up just over a third of the setlist and songs from the 21st century make up half the setlist so this isn’t a nostalgia tour. The band has new music and it fits comfortably with the past. The real fan sing-along moments however came the 90s classic rock, the songs that the fans grew up with. Jon could take a backstep to the audience singing along to Bad Medicine. At a Bon Jovi show the audience takes over the anthem’s You Give Love A Bad Name and Living On A Prayer at every show anyway. It was great to hear Runaway still in the set. The song dates back to the band’s first album in the big hair days of 1984. The nod to The Stones Jumping Jack Flash and the rock and roll medley featuring Isley Brothers, Jerry Lee Lewis (with David Bryan on vocals) and Chuck Berry (a Christmas song for the season) paid homage to their forefathers of rock. On Friday when he met media Jon talked about how the band has now been around for as long as people like Taylor Swift have been alive, so for that generation, they are like The Stones who have been around as long as the Bon Jovi band members have been alive. So it is all about perspective. Previous PostEXCLUSIVE PHOTO SPECIAL: 27th ARIA AWARDS 2013!